After your physician refers you for a Magnetic Resonance Imaging (MRI) examination, you are welcome to send us your requisition forms by e-mail or fax and we will contact you about an appointment. 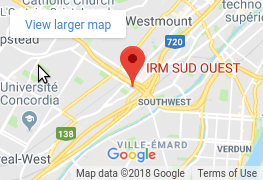 The health professionals at IRM Sud Ouest will provide your doctor with a report within 2 days. Once we receive the referral form from your doctor, we will contact you to book an appointment. You or your physician can fax the referral form to our office at (514) 484-8400. To get an appointment for routine exams usually takes only 2 business days. We will send the results of your examination to your doctor within 2 business days following your appointment. Once the images have been interpreted by a radiologist, your doctor will be in a better position to diagnose your case and prescribe the appropriate treatment. You must inform the attendant of any metal implants or plates that may be in your body, particularly in your head or in the vicinity of your eyes. If you work in sheet metal or with a metal grinder, inform the MRI staff when you make your appointment. Most Exams covered by CSST, SAAQ & private insurance. Financing available. Check with your administrator to see if you qualify. Please bring your referral form if you have not sent it to us already. Unless directed otherwise by your doctor, you may eat and take any usual medication before the MRI examination. However, you will need to tell us which medications you are taking and whether you have allergies, diabetes, heart or kidney disease, or limited mobility. If you have ever had metal in your eye, have any implanted devices, or a pacemaker, please let us know beforehand. As most cosmetics contains metal components, it is recommended that you do not apply make-up before a head or neck MRI. A make-up remover will be provided, if necessary. Pregnant women should not be exposed to an MRI unless approved by a physician. The magnetic field interacts with metallic objects resulting in image degradation. As any metal object is strongly attracted by the magnet, some security precautions need to be taken. Our health care professional will help you lie down on a comfortable padded table. As your exam begins, the table will move into the opening of our MRI system. We will ask you to remain as still as possible during the exam to ensure the best quality images. The body part to be examined will be positioned in the center of a reception antenna. You will be able to communicate with the technologist via intercom for the duration of the examination, which usually lasts about 30 minutes. You will hear a repetitive noise which is normal. You will be supplied with headphones to reduce the noise, and there is an opportunity to listen to your favorite music during the exam. If necessary, a contrast agent will be injected into the arm to enhance the diagnostic image. You will be advised prior to the injection if this is required. This substance (Gadolinium) contains no iodine and side effects are very rare. In order to help those patients who suffer from claustrophobia, IRM Sud Ouest; South West MRI is equipped with the Siemens Espree 1.5T open bore MRI. This hospital grade technology is specially designed for patients with feelings of claustrophobia or those who feel panic in congested spaces. Unlike other machines, the board is wider and the head is outside of the machine. The head-out, feet-out design lets patients feel less restricted, which reduces fear and anxiety. Our staff will keep you informed every step of the way. Remember, we are here to assist you and help you have a low stress MRI experience. Should you have any questions, need assistance, or become uncomfortable during your exam, you can communicate with the health care attendant through our built-in intercom system. Place a cool washcloth or a scented eye bag over your forehead or eyes during the procedure. You may even fall asleep! It is perfectly fine to drift off during your exam. Think of it as nap time. Some patients may request a mild sedative prior to their examination; however, this should be discussed with your doctor. If you do take a sedative, it should be taken approximately an hour and a half prior to the examination. In this case, you should have someone drive you to and from your appointment.